A Round Array Sneak Peek! Stampin' Up! 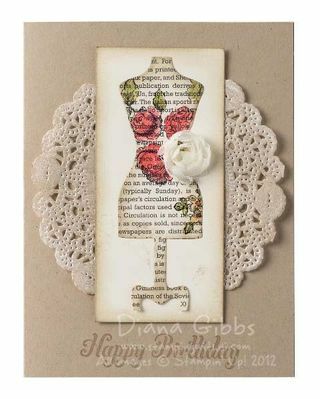 excited to introduce the second Submit a Project kit--the Dolled-Up Birthday Kit--voted on by you via our Facebook page. This gorgeous birthday card was created by Chris Gilmore, a manager from Coshocton, Ohio. Congratulations, Chris! Now you can order the kit to make it. 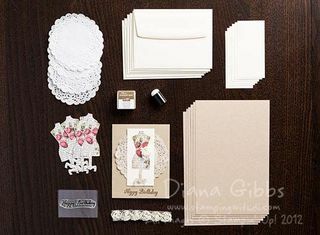 Get everything you need to make six cards for only $15.95 (item 133913)! * Here's more information. Place the stamp on clear-mount block D or H rubber side up and ink with the Soft Suede Classic Stampin' Spot. Stamp "Happy Birthday" at the bottom of the card front. I can't wait until my set arrives!